Director's cut of George P. Cosmatos' Western starring Kurt Russell and Val Kilmer. 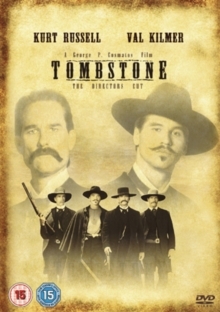 Hoping for a more prosperous lifestyle, retired lawman Wyatt Earp (Russell) moves to Tombstone, Arizona, where he meets up with his friend Doc Holliday (Kilmer). The duo, along with Earp's brothers, soon incur the wrath of a notorious gang of outlaws known as The Cowboys which ultimately leads to the infamous showdown at the O.K. Corral. When The Cowboys retaliate by attacking two of his brothers, killing one of them, Earp becomes even more determined to seek justice.